With Royal Caribbean, NCL, MSC and Celebrity all joining Cunard, P&O and Fred Olsen with new ships in the UK market, recent years have seen a huge increase not only in the number of ships but in the size of ships cruising from UK ports. And there are more to come. From 179,000 ex-UK cruisers in 1998, this number has risen through 217,000 in 2001 to 316,000 in 2004, 403,000 in 2005 and up to 467,000 in 2007, and the 2008 final figures will be available soon. The sailing from home market is now two and two-thirds times its original size a decade ago and could possibly soon be triple that size. So lets have a look at how this happened. Royal Caribbean has been offering cruises from the UK for many years, but starting with the 138,000-ton 3,100-berth Navigator of the Seas in 2007, it decided to base its largest ships in Southampton. The Navigator was followed in 2008 by the 154,000-ton 3,600-berth Independence of the Seas, which arrived in Southampton on April 25. This ship alone was able to lift 60,000 passengers in a full summer season from Southampton last year, following her naming at that port as a new ship. To spread the Royal Caribbean word further it is apparently planned that the latest "world's largest," the 5,400-berth 200,000-ton Oasis of the Seas will call in Southampton on November 8, making the port host to the world's largest ship, each time from Royal Caribbean, two years in a row. If this happens, she is scheduled for a five-hour call but last year sister line's Celebrity Solstice was scheduled for Southampton and never called. Royal Caribbean's presence in the UK goes back many years, to the first UK fly/cruises from Miami in the 1970s, and then in the early 1990s, with two of its original trio of cruise ships, the 23,000-ton 1,040-berth Song of Norway and 18,500-ton 728-berth Sun Viking, offering cruises from Harwich. The company's UK ties are also more extensive than at first glance. Chairman and CEO Richard Fain spent thirteen years in London working for one of Royal Caribbean's original shareholders, Gotaas-Larsen Shipping, before joining Royal Caribbean twenty years ago now. And only last year one of Royal Caribbean's main shareholders, Sammy Ofer with a 16.5% share, donated £20 million to building a new wing at the National Maritime Museum in Greenwich and has also donated £3.3 million to rebuilding the clipper ship Cutty sark after her fire. Ofer's shipping empire also includes London-based Zodiac Maritime Agencies and Zim Integrated Shipping of Israel and around 90 of his vessels fly the British red ensign. NCL has been sailing from Dover for many years now but 2008 was the first time it had two of its newest and largest ships sailing from UK ports, with the 94,500-ton 2,400-berth Norwegian Gem sailing from Dover and sister ship Norwegian Jade from Southampton after she was transferred from the line's downsized NCL America operation. NCL has greatly increased its presence in Europe over the past few years, also operating year-round from Barcelona. An innovation for NCL is that over its UK season it offers many shorter 3- and 4-night sampler cruises in an attempt to entice new business. NCL was founded by the Kloster family from Norway, whose first passenger ship, an unsuccessful Southampton to Gibraltar overnight ferry, the 8,650-ton 634-berth Sunward, went to Miami as the then Norwegian Caribbean Line's first ship, under Arison management. Now named Norwegian Cruise Line, the company is owned by Apollo Management of the USA and Star Cruises of Hong Kong. The Norwegian Jade is the first NCL-associated ship to operate from Southampton in the over forty years since the Sunward gave up her service to Gibraltar to become a Miami-based cruise ship. Starting with the 16,850-ton 788-berth Rhapsody sailing from Dover in 2007, MSC has quickly moved through the 58,625-ton 1,566-berth MSC Armonia in 2008 and the 59,000-ton 1,560-berth MSC Lirica this year. In 2010, MSC may replace the Lirica with yet another, even larger, ship. MSC has a large presence in the UK through its container line that operates mainly from Felixstowe. And last year, it christened its MSC Poesia in Dover. It is interesting that MSC have become the Italian line to operate from the UK as Costa Cruises had started an ex-UK operation from Southampton with the Enrico Costa in 1992. Celebrity has offered cruises from the UK in past years, usually from Harwich, and has often showcased its new ships in Southampton, but 2010 will be the first year that one of its brand new ships, the 122,000-ton 2,850-berth Celebrity Eclipse, will be based in Southampton. In fact, it has just last week been revealed that she will arrive in the UK two months early, to begin cruising from Southampton in April 2010, starting with some 4-night cruises to Cork in the spring, followed by a full season of 11-, 14- and 16-night cruises to the Canaries, the Med and the Baltic until October 2010. In many ways, this is actually a return to the UK market for this operator, as predecessor Chandris Cruises had for many years been one of the UK's main operators, when it had based cruise ships in Southampton. Ships such as the Australis, Regina Magna and others were popular with UK cruisers. And even before that it had operated liner services from Southampton to Australia when emigrants to "down under" had travelled on £10 assisted passages. Cunard has cruised from Southampton for many decades but it is only since the 70,327-ton 1,728-berth Queen Elizabeth 2 became a dedicated UK cruise ship in 2005, after the delivery of the new 151,400-ton 2,620-berth Transatlantic liner Queen Mary 2, that Cunard has actually become a full-time UK-based cruise line. With the addition of the 90.050-ton 2,000-berth Queen Victoria at the end of 2007 and the 92,000-ton 2,000-berth Queen Elizabeth to arrive in 2010, Cunard will have two ships at the luxury end of the market plus the Queen Mary 2 serving New York. Management of Cunard Line was moved back to Southampton last year for the first time in many years after stages spent in New York, Miami and even outside Los Angeles for a while. The company has often had a British president, but the present incumbent, Carol Marlow, is also a British resident. In the UK since 1837, P&O must be the quintessential British cruise line, even moreso than Cunard, which has been better known for its Transatlantic offerings. Operating with just one ship, the 45,720-ton 1,414-berth Canberra, at one stage, P&O has moved forward slowly and steadily one ship at a time, to the stage where it now operates a fleet of half a dozen ships from Southampton, including its latest, the 116,070-ton 3,100 -berth Ventura, added in 2008. To follow in 2010 will be a seventh ship, the Azura, a sister ship to Ventura that will be aimed more at adults. The 69,150-ton 1,828-ton Oriana of 1995 and 76,150-ton 1,850-berth Aurora of 2000 were its first newbuilding cruise ships since the 17,370-ton 686-berth Spirit of London in 1972. To this pair was added the 85,000-ton 1,968-berth Arcadia in 2005, so a new ship every five years. However, two other ships were acquired from sister fleet Princess Cruises in the 77,500-ton 1,950-berth Oceana, the former Ocean Princess, in late 2002, and the 44,350-ton 1,200-berth Artemis, previously the Royal Princess, in 2005. While P&O has always been child-friendly (remember that old P&O poster with a ship's officer holding a child's hand as they walked along the promenade deck? ), P&O has now chosen to operate two of its ships, the Arcadia and Artemis, as adults-only ship. For a while, the ship with the peculiar name Adonia (as if in Adults Only) fulfilled this role. A sister company of P&O, and run from outside Los Angeles, Princess Cruises had been formed by Stan McDonald in 1965 and was acquired by P&O in 1974. Originally American-based, over the years, as its fleet expanded, Princess ships have only come to UK waters in fairly recent times. 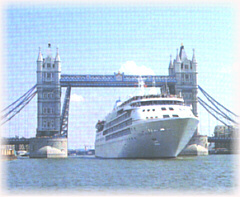 First basing its 77,500-ton 1,950-berth Sea Princess (which had briefly operated as P&O's Adonia) in Southampton as a UK-dedicated ship in 2005, this was an attempt within the P&O Princess group to offer an alternative American-style type of cruising in the UK market. So successful has this been that Royal Caribbean have joined the fray and the Sea Princess is to be replaced by the 109,000-ton 2,600-passenger Grand Princess in 2009, thus increasing Princess's UK ship capacity by a third, but still behind Royal Caribbean's offerings. Starting with the little 11,209-ton 440-berth Black Prince in 1986, Fred Olsen Cruise Lines, like P&O, has grown with the UK market. It now operates five ships from the UK, with the 43,500-ton Balmoral, added last year, the 28,000-ton 800-berth sister ships Black Watch and Boudicca and the 24,340-ton 987-berth Braemer, recently lengthened. 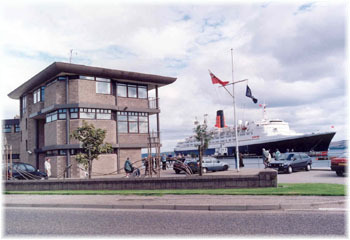 Fred Olsen have very long connections with the UK indeed, as it operated the Newcastle-Bergen ferry service for many years and still today maintains this link with Black Prince sailing from northern ports. The Boudicca will replace the Black Prince on these departures after she is retired later this year. As well as cruises from Newcastle, these include summer sailings from Liverpool and a number of cruises from Leith (for Edinburgh). Fred Olsen also owns the famous Harland & Wolff shipyard at Belfast that built most of the White Star Line fleet. Long present in UK ports, variously at Southampton in the liner days and at Harwich and Dover in cruise days, in 2009 Holland America will be offering a new program of a few cruises from Greenwich and Dover by its smallest ship, the Prinsendam. Included will be two Round Britain cruises from Greenwich in July and August, but overall the program will be modest. Sister company Carnival Cruise Lines, on the other hand, has dropped its plans to offer ex-UK cruising with its Carnival Liberty. In summary, ex-UK cruising has seen great growth over the years, up by 160% in a decade. This compares with UK growth in fly/cruising from 484,000 in 1998 to 870,000 in 2007, or 80%, while the overall market has doubled. Or, put another way, the proportion of British people taking an ex-UK cruise has risen from 27% in 1998 to 35% in 2007. The figures for 2008 will follow shortly.